Discovering Teas Around the World From the cool, rainy climate of Northern Ireland to the benign sunshine of Tasmania, Camellia sinensis is now cultivated in more than 65 countries around the globe. Jane Pettigrew’s exploration of tea farming and manufacture reveals the care and dedication of all those who nurture this remarkable plant to offer us an infinite choice of wonderful teas. ©Harendong Green Farm Used by permission. For assistance with advertising, please call (888) 411-8995.
teatimemagazine.com British Tea is published by Hoffman Media, LLC, 1900 International Park Drive, Suite 50, Birmingham, AL 35243. The cover and contents are fully protected by copyright and cannot be reproduced in any manner without prior written permission. All rights reserved in all countries. ©2019 Hoffman Media, LLC. Printed in the USA. I have been very fortunate to have traveled to England on three separate occasions thus far in my life, though the ﬁrst two visits were long before my interest in drinking tea or in having afternoon tea truly developed. It wasn’t really until my most recent trip that I was able to appreciate fully the rich tea traditions of the UK—from lovely formal afternoon teas at The Goring Hotel, St. Ermin’s Hotel, and The Rubens (pictured at left), the latter located directly across the street from one of the entrances to Buckingham Palace, to an ultra-casual teatime of fresh-baked fare and perfectly prepared tea at the charmingly eclectic Brew Babu in the 10th-century town of Oundle. While there certainly are plenty of tea histories and traditions, as well as marvelous venues for any style of afternoon tea possible in London, my day trip outside the capital city showed me that there are so many tea treasures still to be experienced. I trust the myriad of articles in this special issue will serve as a travel guide for your next trip to the UK—or at least will have you dreaming of one—and that our British-themed menus, tea pairings, and table settings will inspire you to plan a jolly good teatime without even needing a passport. May all your tea dreams come true! Contributing Writers Cindy-Lou Dale Cindy-Lou is a nonﬁction writer and photographer who works with numerous publications around the world. Her childhood roots are buried deep in a small farming community in Southern Africa. Following university (in South Africa, the USA, and Belgium), her work has taken her around the world. She has lived in 15 countries, but now she has chosen to slow down her semi-nomadic life and lives in South East England. Here, Cindy-Lou claims, she needs to look no further than her garden gate for inspiration, as just beyond is a handsome church that has been standing there, adding a touch of nobility and grandeur to the landscape, for more than a thousand years. “Here it is just an anonymous country church, treasured by a few ageing parishioners . . . and me,” she says. Cindy-Lou regularly travels on assignment to far-ﬂung destinations, gathering information and experiences and taking photographs used in her articles. In this instance, she took a 35-minute train journey to London to visit Lady Dinah’s Cat Emporium. Jane Pettigrew An international tea expert, Jane Pettigrew is recipient of the British Empire Medal for Services to Tea Production and Tea History in 2016. A former tearoom owner, Jane is a contributing editor for TeaTime magazine and a much-sought-after consultant to tea businesses and hotels, a conference speaker, and an award-winning tea educator. She currently serves as the course director at the new UK Tea Academy. Her articles and essays on various tea-related subjects have appeared in newspapers and magazines both in the United Kingdom and overseas. Jane appears regularly on television and radio to discuss the various aspects of tea and tea history. Her newest book, Jane Pettigrew’s World of Tea, was published in 2018 by 83 Press (83press.com/jane) and is an educational resource tool for those who are passionate about tea and want to learn about the leaf and the more than 60 countries where it grows. Although her travels take her around the globe, she resides in London. Tea-steeping Guide The quality of the tea served at a tea party is as important as the food and the décor. To be sure your infusion is successful every time, here are some basic guidelines to follow. electric kettle to the desired temperature. A microwave oven is not recommended. leaf per 8 ounces of water, and use an infuser basket. For a stronger infusion, add another teaspoonful or two of dry tea leaf. can yield a bitter infusion.) When the timer goes off, remove the infuser basket or the tea bags from the teapot. For best ﬂavor, serve the tea as soon as possible. Keep the beverage warm atop a lighted warmer or under your favorite tea cozy if necessary. TEA FA R E & SETTINGS Inspired by traditional foods of England, Ireland, and Scotland, delectable treats, accompanied by expert tea pairings, are presented on beautiful wares for a proper afternoon tea. *Several companies make Major Grey’s chutney, a relish made with mangos, raisins, onions, vinegar, and spices. Look for jars of this condiment in the pickle section or the British foods section of most grocery stores. *We used Colman’s of Norwich Original English Mustard. MAKE-AHEAD TIP FOR ALL TEA SANDWICHES: Sandwiches can be made an hour in advance, covered with damp paper towels, placed in a covered container, and refrigerated until serving time. MAKE-AHEAD TIP: Tartlet shells can be baked a day in advance and stored at room temperature in an airtight container. Custard mixture can be made a day in advance, placed in a covered container, and refrigerated until needed. MAKE-AHEAD TIP: Tŏee-Walnut Cookies can be baked in advance and stored in an airtight container at room temperature for a few days or in the freezer for up to 2 weeks. Let thaw before serving. MAKE-AHEAD TIP: Cake can be baked a week in advance, wrapped tightly in plastic, and stored in the freezer. Let thaw completely before ¿lling and glazing. MAKE-AHEAD TIP: Quiches can be baked a day in advance and stored in a covered container in the refrigerator. Reheat on a rimmed baking sheet in a 350° oven for 6 to 8 minutes. Pipe topping onto cut side of bottom rounds. Top each with a remaining cake round, and pipe a rosette of topping on each. • Garnish each stack with a thyme sprig, if desired. powder, approximately 30 seconds. • Add whole-wheat ﬂour, 1 cup allpurpose ﬂour, brown sugar, and ½ teaspoon salt, pulsing to combine. Add cold butter, pulsing until mixture resembles coarse crumbs. • Add cream, pulsing just until dough forms a ball. Wrap dough tightly in plastic wrap. Refrigerate until ﬁrm, approximately 1 hour. • Divide dough into 12 equal pieces. On a lightly ﬂoured surface and using a rolling pin, roll each dough portion to a 1⁄8-inch-thick rectangle. Press dough rectangles into the bottom and sides of prepared tartlet pans, trimming excess dough as necessary. Using the large end of a chopstick, press dough into indentations in sides of tartlet pans. (See Tartlet Crust Howtos on page 69.) • Place tartlet pans on a rimmed baking sheet. Freeze for 30 minutes. • Preheat oven to 350°. • Using a fork, prick the bottom and sides of dough in tartlet pans. • Bake until crust is lightly golden just around the edges, approximately 8 minutes. Let cool. • Reduce oven temperature to 325°. • In a large bowl, combine granulated sugar and remaining 1½ tablespoons ﬂour, stirring well. Add buttermilk and eggs, stirring until combined. Add melted butter, vanilla extract, lemon zest, lemon juice, cinnamon, nutmeg, and remaining ¼ teaspoon salt, stirring well. Divide mixture evenly among prepared tartlet pans. • Bake until ﬁlling is lightly golden around edges and almost set, 16 to 20 minutes. • Let tartlets cool in pans on baking sheet for 10 minutes. Carefully remove tartlets from pans, and let cool completely on a wire rack. Place tartlets in a single layer in a covered container, and refrigerate until cold, approximately 1 hour and up to a day. • Just before serving, garnish with a dusting of confectioners’ sugar and fresh strawberry slices, if desired. slices. Lay cucumber slices on paper towels, and blot dry. • Pipe cream cheese mixture onto 8 bread squares, beginning with perimeters and then ﬁlling in centers. Lay 4 cucumber slices atop cream cheese layer on each bread square, letting cucumber slices hang over edge of bread. Top with another bread square. • Serve immediately, or cover sandwiches with damp paper towels for up to an hour until ready to serve. MAKE-AHEAD TIP: Cream-cheese mixture can be made a day in advance, placed in an airtight container, and refrigerated until serving time. Let come to room temperature before using. Bread squares can be cut a day in advance and stored at room temperature in a resealable plastic bag. *We used a Kyocera mandoline, which is available at surlatable.com. You can also use a small, sharp paring knife to cut cucumber as thinly as possible. MAKE-AHEAD TIP: Salmon Mousse can be made a day in advance and refrigerated overnight. Sandwiches can be made earlier in the day. (Trim crusts, but do not cut into triangles until ready to serve.) Cover with damp paper towels, place in an airtight container, and refrigerate until serving time. KITCHEN TIP: To create even layers of sandwich ¿lling in a triple stack sandwich, measure ¿lling before spreading onto bread slices. MAKE-AHEAD TIP: Cookies can be baked a week in advance and frozen, unglazed, in an airtight container. Let thaw completely before glazing. over milk chocolate morsels. Stir until morsels melt and mixture is smooth and creamy. Use immediately. over ﬁrst cake layer. Carefully spoon strawberry–whipped cream mixture over jam, spreading into an even layer. Place second cake layer over whipped cream, bottom side up. • Lay a decorative stencil or doily over cake. Sift remaining 1⁄3 cup confectioners’ sugar over stencil, making sure all cutout areas are ﬁlled in evenly. Very carefully lift stencil up and off cake. Carefully remove wax paper strips from around cake base. • Garnish top of cake with a fanned strawberry, if desired. Serve immediately. MAKE-AHEAD TIP: Cake layers can be baked a day in advance and wrapped in plastic wrap. Whipped cream can be made earlier in the day and refrigerated until needed. Add strawberries just before using. Cake can be assembled up to an hour before serving and refrigerated until needed. MAKE-AHEAD TIP: Filling can be made a day in advance, stored in an airtight container, and refrigerated until needed. Bring to room temperature before ¿lling bridies. horizontally into thin slices. • Spread piccalilli onto toasted bread rounds. Top each with a sausage patty, a cheese round, and an egg slice. Serve immediately. *Piccalilli is a ﬂavorful relish made from pickled vegetables, such as cucumber, onion, and cauliﬂower. We used Heinz Piccalilli Pickle. Look for jars of this condiment in the pickle section or the British foods section of most grocery stores. *For even slices, use a mandoline. MAKE-AHEAD TIP: Sandwiches can be made an hour ahead, covered with damp paper towels, placed in an airtight container, and refrigerated until serving time. completely before removing from tartlet pans. • In a medium bowl, beat cream at high speed with a mixer until soft peaks form. Slowly add sour cream, whiskey, and 1 tablespoon honey, beating until incorporated. • Divide cream mixture among tartlet crusts. Top with raspberries. Drizzle with remaining 1 tablespoon honey. Top with reserved granola crumbs. *We used Dewar’s White Label Scotch whiskey. *We used an 8-inch hexagonal Scottish thistle ceramic shortbread pan from Brown Bag Designs, shortbreadpan.com. Shortbread can also be baked in an 8-inch round cake pan. 1 tablespoon salted butter 1 cup chopped yellow onion 6 tablespoons Major Grey’s chutney* ¼ cup tomato purée ¼ cup water 2 tablespoons red wine vinegar 2 tablespoons curry powder 1 tablespoon fresh lemon juice ½ teaspoon salt ¼ teaspoon ground black pepper 1 bay leaf ½ cup mayonnaise 3 cups ﬁnely chopped roast chicken ½ cup chopped toasted slivered almonds 3 tablespoons ﬁnely chopped dried apricots 2 tablespoons ﬁnely chopped green onion (green tops only) 2 tablespoons ﬁnely chopped parsley 2 tablespoons dried currants 12 slices potato bread In a large sauté pan, melt butter over medium heat. Add onion, and cook, stirring occasionally, until onion is tender and translucent, 5 to 7 minutes. Add chutney, tomato puree, water, vinegar, curry powder, lemon juice, salt, pepper, and bay leaf, stirring to combine. Bring to a simmer. Simmer, stirring occasionally, until sauce is thick (like ketchup), 8 to 10 minutes. Pour sauce into a large bowl, and let cool completely. • Remove bay leaf from sauce, and discard. Add mayonnaise to cooled sauce, stirring to combine. Add chicken, almonds, apricots, green onion, parsley, and currants, stirring to blend. • Spread a thick layer of chicken salad onto a bread slice. Top with another bread slice. Repeat with remaining chicken salad and bread slices. • Using a serrated bread knife, trim crusts from sandwiches, creating squares. (Discard crusts.) Cut sandwiches diagonally into quarters, creating 4 triangles. *Several companies make Major Grey’s chutney, a relish made with mangos, raisins, onions, vinegar, and spices. Look for jars of this condiment in the pickle section or the British foods section of most grocery stores. MAKE-AHEAD TIP: Chicken salad can be made a day in advance. Sandwiches can be made earlier in the day, covered with damp paper towels, placed in an airtight container, and refrigerated until serving time. MAKE-AHEAD TIP: Egg salad can be made a day in advance, placed in an airtight container, and refrigerated until needed. MAKE-AHEAD TIP: Salmon mousse can be made a day in advance and refrigerated until needed. Bread rectangles can be made a day in advance and stored in an airtight container at room temperature. KITCHEN TIP: To retain freshness, soak fresh dill sprigs in iced water for 15 minutes before garnishing. We used a Wilton round linzer cookie– cutter set. *We used Clearbrook Farms Mini Bite-size Sweet Tart Shells. sure plastic is in contact with fondant to prevent it from drying out. • Just before serving, unwrap cake. Using a long, serrated knife, trim ends, and cut cake into ¾-inch slices, using a gentle sawing motion. Let these step-by-step photos serve as your visual guide while you create these impressive and delicious teatime treats. 1 Press dough shapes into tartlet pans. Using a cutter, cut shapes from dough. Using the wide end of a chopstick, push dough into indentations of pan. 1 Using a piece of foil approximately 8 inches long, make a foil divider for pan by folding foil in half, and then fold in half again. Stand foil rectangle in the center of pan to create a divider. Spray divider with cooking spray. 4 Using a pastry brush, coat tops of both yellow cake sections with melted jam. Stack a pink section on top of each yellow section. 7 Brush top of cake stack with melted jam. Place cake stack, jam side down, in center of fondant sheet. 2 Place another piece of parchment paper (approximately 12x8 inches) over foil divider in prepared pan, folding as needed to ďŹ t. Spray parchment paper again. 3 Spread yellow batter into one side of prepared pan and pink batter into other side, smoothing top and creating a level surface. 5 Flip one stack so that yellow section is on top. Brush long side of one stack with melted jam. Press sides together. (Jam will serve as the glue.) Trim ends of cake stacks evenly. 8 Brush top and remaining sides of cake stack with jam. Wrap cake with fondant, pressing and smoothing fondant so that it adheres to cake. TEA EXPERIENCES & TRADITIONS Discover the history of beloved tea customs while exploring a fascinating assortment of tearooms and venues in regions such as Yorkshire, London, and the Cotswolds. Downton Abbey Lady Carnarvon talks about life at Highclere Castle, the impact of the popular period drama, and where she likes to have tea. Saloon (Above) Physically and socially, the gothic-style Saloon is the heart of Highclere Castle. The leather wall coverings of this impressive space date to the 17th century and are ornately embellished with golden scrolls and polychrome botanicals. cup of tea and Downton Abbey make a perfect pairing whether you enjoy your tea milk-in-ﬁrst or milk-in-last (the former practice historically tied to the downstairs staﬀ; the latter, to the upper class). No matter which side of the manor you identify with, Downton Abbey fans are united in their devotion to the show, whether it be the ﬁctional story, the reallife characters who inspired it, or a combination. Downton Abbey aired on PBS’s Masterpiece from 2011 until 2016, and for the ﬁrst two months of those years, many Americans welcomed the members of the aristocratic Crawley family and their downstairs staﬀ into their homes every Sunday night. In turn, the Carnarvons have been opening the doors to their country estate, Highclere Castle (the blue-blood clan and residence, respectively, that inspired Downton Abbey), to the public for years. Fans of the patrician lifestyle get a glimpse of what it’s like to reside in a home that contains not only the grand furnishings passed down from generation to generation but also the stories of ancestors ripe for the retelling. As the author of two books on the former residents of the country estate as well as of a 2017 release about entertaining there, the current Countess of Highclere, Lady Fiona Carnarvon (married to George Herbert, the 8th Earl of Carnarvon) has become the face of the real Downton Abbey. While some may ﬁnd it daunting to receive so many guests each year, Lady Carnarvon considers it as part of Highclere’s history. “Highclere has welcomed visitors since 1988,” says Lady Carnarvon, “and whilst we are busier and are delighted to see more international visitors, it has been part of my life ever since I married Geordie (my husband).” The Carnarvons were also delighted to welcome Downton back to Highclere again, she says, for the ﬁlming of the Downton Abbey movie, whose eagerly anticipated release in cinemas is scheduled for September 2019. “Julian [Fellowes, the show’s creator,] and the wonderful cast and crew of Downton Abbey were so much a part of our lives for so many years, and it is very special to develop the next role with them.” Aside from the familiar characters and smart writing, what fans may have missed most of all is the silent star of the series—and now, of the movie—the country manor itself. Its alter ego, Highclere Castle, has arguably become, to many, as recognizable and iconic to England as Westminster Abbey or Buckingham Palace. Visiting this impressive estate is now an industry unto its own and a boon to the Carnarvon family. Tour groups come in droves to this Hampshire country manor to connect with the popular Edwardian series. As buses ﬁlled with Downton Abbey fans ascend the estate—and the view of the grand home is still the size of a postage stamp—guests immediately recognize the familiar landscape that spans acres. The grounds of Highclere are picturesque and dappled with gardens and follies, popular in the time of the home’s construction. But it is the manor home that, once in full view, strikes a deep emotional chord with the audience. Built in the late 17th century, it has been home to generations of the Carnarvon family. The residence has endured over the centuries, having received a major facelift in the early 19th century that gave the ediﬁce a limestone front fans will recognize as the Downton Abbey of today. Once the multitude of buses park, visitors eagerly line up at the front entrance of Highclere as doors open to welcome them inside. Tourists enter and walk through the rooms on the ground ﬂoor with the easy comfort of visiting an old friend. Guests then make their way upstairs to get a peek at a few of the bedrooms on the ﬁrst ﬂoor. Climbing the stairs, it’s easy to envision the towering Christmas tree below or to spot a number of hiding places along the hallway for convenient eavesdropping by family and staﬀ alike. Perhaps the most recognizable room is the Library, where Downton Abbey viewers have witnessed many snappy exchanges among family and staﬀ. It wears the patina of aged furnishings and family portraits—the red velvety couches are at once opulent and welcoming. It also ranks among Lady Carnarvon’s favorite rooms. “I love the Library,” says the current Countess of Highclere. “The proportions and decoration are both impressive and restrained. [In addition], I like my study, as it is full of photos and mementos that matter to me. I rather like climbing the stairs to the tower. The rooms are quirky, [they have] wonderful ceilings, and the views are extraordinary.” With so many lovely rooms at their disposal, the Carnarvons don’t restrict teatime to any one particular space, and they consider the occasion as well as the season. “In the winter, we may have tea in the Smoking Room, as the paintings are exceptional, and it is a good time of day to enjoy them. The original tea chest sits in the Drawing Room, but today I see that room less for tea as it works so well for cocktails, and it is a treat to share diﬀerent parts of the house with our guests.” In addition, the Carnarvons take advantage of the well-manicured grounds for afternoon tea, weather permitting. (Above) Although Highclere Castle’s original tea chest is in the Drawing Room, the Carnarvons use that room frequently for cocktails. (Below and opposite page, top) The Library is one of Lady Carnarvon’s favorite rooms, especially for afternoon tea. The very English tradition endures in picturesque towns and villages. et in South Central England, the Cotswolds are an expanse of gently rolling hills and meadows that cover a 787-square-mile area and stretch from Warwickshire and Worcestershire through Oxfordshire, Gloucestershire, and Wiltshire to Bath and Somerset. The name is said to refer to the “sheep enclosures in rolling hillsides” of the past. (In medieval times, Cotswold sheep were famous throughout Europe for their thick, heavy ﬂeeces and high-quality wool.) Designated an Area of Outstanding Beauty in 1966, the gentle landscape stretches out in all directions, lyrical and welcoming. The vast acres of undulating farmland are separated only by ancient drystone walls and clumps of woodland where tall trees form dappled leafy tunnels over winding country roads. Nestling amongst the tranquil countryside, picturesque villages and small towns—made rich by the wool trade of the past— boast grand churches with tall steeples, old coaching inns where weary travelers and exhausted horses once rested, thatched cottages, and gracious manor houses with exquisite gardens and walls of yellow Jurassic limestone that gleams honey gold in the summer sun. cranberry sandwich, and the cake stand will be arranged with mid-winter treats such as an orange and mascarpone mont blanc, a chestnut macaron, a coconut and pineapple snowman, and a chocolate and cherry yule log. Pastries at other times of the year have recently included such yummy indulgences as white chocolate and ginger dome with honeycomb topping, Champagne and strawberry jelly with strawberry mousse, carrot cake with orange mascarpone, raspberry and passion fruit macarons, dark chocolate mousse with salted caramel, and vanilla and white chocolate cheesecake with raspberries. The unusual list of loose-leaf teas oﬀers a tiramisu-ﬂavoured tea, a China green ﬂavoured with tropical fruits, and a fruity berries infusion with ﬂoral notes and hints of liquorice, as well as favourites such as Assam, Lapsang Souchong, Earl Grey, and English Breakfast. David Williams, the hotel’s executive chef, has always focused on creating dishes that feature seasonal ﬂavours and colours, and under the direction of recently appointed General Manager Marwan Hemchaoui, who joined the hotel in September 2018, the Ellenborough Park afternoon tea is set to become an even more delicious and special experience. Tracey Sone, owner of this extremely successful traditional tearoom, started her career in tea in the 1980s when she was just a young teenager. Her ﬁrst job at Teatime, a tearoom in London, was washing dishes on Saturday and Sunday afternoons. Then when she left school, she graduated to running the kitchen and soon became the tearoom manager. When the shop was sold in 1989, she went to work for Whittard (the High Street tea retailer) and then ran their warehouse for seven years. But in the back of her mind was her determination to run her own tearoom, and for the past 12 years, that is exactly what she has been doing—managing Tisanes with the same energetic eﬃciency and concern for all her customers as she did at Teatime. Tisanes occupies a traditional 17th-century stone building at the lower end of Broadway’s attractive High Street (or broad way) where 16th-, 17th-, and 18th-century stone buildings are homes to art galleries, restaurants, pubs, and lovely shops selling gifts, high-end clothing, jewellery, and local products. Tisanes is a haven for Broadway residents and tourists alike, is always busy, and attracts constant interest from local radio stations and organizers of local events (food markets, seasonal festivities, music festivals, clubs, and societies) who know that Tracey will always deliver a thoughtful, reliable, high-quality service. Tisane’s tea menu is impressive and includes black, oolong, green, and white loose-leaf teas from around the world and a long list of blends, ﬂavored teas, and herbal infusions. From 10 a.m. to 5 p.m., customers can choose sandwiches, toasted sandwiches, light lunch dishes, scones, and a tempting variety of cakes. Whenever guests call in, they are guaranteed a warm welcome; a friendly, chatty atmosphere; and a good pot of tea. And before leaving, they can buy jars of jams and jellies, pickles, chutneys, and mustards, books, and, of course, packets of tea to brew at home. Huﬀ kins is to the Cotswolds what Bettys is to Yorkshire. The independent, family business owns and manages tearooms in ﬁve Cotswold towns and has a craft bakery that produces irresistible breads, cakes, scones, and savoury treats that are oﬀered in the tearooms and also sold at their retail counters. The company dates back to 1890, when a Mr. Titcomb opened the ﬁrst shop on the High Street of Burford, one of the busiest and prettiest towns in the region. In those days, the now famous breads and cakes were delivered by donkey and cart to nearby customers. The Burford tearoom today (pictured at left) is housed in two Grade II–listed buildings, one of which still contains the original bake house, and Huﬀ kins bakers work through the night to produce enough bread for all the sandwiches served in the ﬁve shops. Essential ingredients are sourced locally wherever possible so customers are served authentic Cotswold food. The company believes it is important to “feed the eyes ﬁrst,” so the retail items look really tempting. The tearoom in Witney sits at the lower end of the High Street in a Grade II–listed Victorian shop with a wrought-iron frontage typical of the period. In Stow-on-the-Wold, Huﬀ kins occupies another Grade II–listed Cotswold stone building and overlooks the bustling market square. The Cheltenham branch, the smallest of the ﬁve tearooms, is located in a Grade II–listed Regency building dating back to the beginning of the 19th century, and the tearoom in Stratford-upon-Avon is in a charming Grade II–listed building with pretty bay windows and exposed wooden beams made from old ships’ timbers. The range of food and teas oﬀered at all locations means visitors can always ﬁnd something on the menu to suit the time of day and individual tastes. And don’t miss the famous luxury fruit cakes! They are matured for 30 days to allow the complex ﬂavours—Cranberry & Orange, Apricot & Almond, Cherry & Pecan, Date & Walnut, or Chocolate & Orange, among other seasonal combinations—to develop, then the sides of the cakes are trimmed away to ensure that every single bite of them is packed full of deliciousness. Victoria Wills set up her award-winning tea business after organizing a memorable vintage afternoon-tea party for her daughter’s 18th birthday. She already owned some pretty antique teawares but scoured local shops and markets for enough vintage china to host 65 guests. 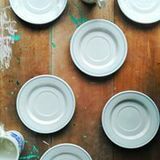 And once local friends and neighbors knew what she was looking for, they oﬀered her their unwanted cups and saucers, hand-embroidered tablecloths, linen napkins, three-tiered cake stands, and vintage cutlery. She now owns enough tea sets for 300 people, and since 2012, the company that grew out of that family party has been creating bespoke tea events for weddings, birthdays, baby showers, christenings, and anniversaries. Clients choose the venue, the menu, and the teas, and Victoria’s team delivers everything, sets up the room, serves the guests, and clears away afterwards, creating really special, trouble-free, indulgent tea occasions. As if all that work weren’t enough, in 2016, Victoria also opened her ﬁrst tearoom, The Tea Set, in the center of Chipping Norton, a busy market town at the heart of the Cotswolds and famous for its wealthy media, political, and show-business residents (including David Cameron) known as the “Chipping Norton Set”—hence the company’s name. The shop has an easy-come, easygo ambiance that suits visitors of all types with its mix of old wooden dining and side tables inside and white wrought-iron tables outside; a medley of chairs from different eras; mix-and-match teawares in an assortment of colours, styles, and patterns; gentle jazz music from the 1920s and ’30s; and very kind staﬀ. In early 2017, Victoria opened a second vintage-style tearoom on Church Close in the nearby medieval town of Broadway. ritain’s National Trust is a much-loved conservation charity that protects and preserves some of the country’s ﬁnest historic houses, gardens, and countryside. As well as tracing the nation’s social and political development, many of the houses contain furniture, porcelains, silverwares, and stories that bring our tea history to life. Of the hundreds of Trust properties, ﬁve manor houses in the south of England reveal secrets and special tea moments dating from the middle of the 17th century to the elegance of Edwardian Britain. Queen Catherine drank tea at Ham House; Polesden Lacey’s Edwardian tearoom hosted international politicians and ambassadors; handpainted Chinese wallpaper at Saltram House illustrates 18th-century tea processing; Castle Drogo was built with money made by selling tea; and in the 1880s, Queen Victoria and the Prince of Wales both took tea at Waddesdon Manor. All these houses are open to the public, and each has a tearoom that welcomes thirsty visitors for a rest and a recuperative cup of tea, a piece of cake, or a scone with jam and cream after they have wandered through historical rooms that showcase precious furnishings, porcelains, silver wares, books, and paintings and teach us so much about our past. (Above) The portrait of Elizabeth Murray, later known as Duchess of Lauderdale, and a servant by Sir Peter Lely, circa 1651, is on display in the Long Gallery at Ham House. restored to the throne and in 1662 married Portuguese princess Catherine of Braganza, who introduced tea to the English aristocracy. Of course, Elizabeth became close friends with Catherine, and the Queen often visited Ham House. A suite of rooms on the ﬁrst ﬂoor was furnished for Catherine’s visit in 1673, but the real jewel in the Ham House crown is the Duchess’s Private Closet, a small room near the Duchess’s bed chamber on the ground ﬂoor where Elizabeth and Catherine took tea together. On the lacquered Javanese tea table sit small porcelain tea bowls and Elizabeth’s rare Chinese porcelain teapot that was produced at the Zhangzhou kilns of Fujian province in the 17th century. Such pots were not normally imported into England, and a European merchant probably acquired this ﬁne example privately. Visitors may walk through this little treasure of a room and imagine the Queen and the Duchess quietly sipping tea together and perhaps sharing the latest court gossip. Today, visitors take tea in the oldest orangery in Britain, built in the 1670s, that overlooks the walled kitchen garden. (Left and right) The 17th-century diarist John Evelyn described the Duchess of Lauderdale’s home as “furnished like a great Prince’s with tapestries, damask, velvet, mohair on walls, bedsteads, chairs upholstered in luxurious fabrics.” Her tea equipage, too, was the very ﬁnest. (Above left and below right) Visitors to Ham House can have tea in its orangery. At Polesden Lacey, Mrs. Margaret Greville (right) lavishly entertained members of the highest social circles. King Edward VII described her gift for entertaining as “genius,” but although kind and thoughtful, she had a very sharp tongue and her wit was described by some as “honeyed poison.” (Below) Tea fare is available in the Granary Café. George V, and George VI and Queen Elizabeth (mother of our present queen), who honeymooned here in 1923 before George became king. Margaret and Ronnie were so dedicated to surrounding themselves with famous, rich, and inﬂuential people that some rather unkindly referred to them as the “Grovels” rather than the Grevilles. The house was designed for entertaining, and tea was served every afternoon. In his 1974 book, Down the Kitchen Sink, Beverley Nichols describes how “tea is at 5 o’clock, and at Polesden, 5 o’clock means 5 o’clock and not 5 minutes past. Which in turn means that the Spanish ambassador, who has gone for a walk down the yew avenue, hastily retraces his steps, and that the Chancellor of the Exchequer, whoever he may be, hurries down the great staircase, followed by several members of the House of Lords, and that various ladies belonging to these gentlemen rise from their chaises longues on which they have been resting in their bedrooms, removing the perfumed anti-wrinkle pads which they have been balancing on their foreheads, and join the procession to the tea table which is set out in one of the smaller drawing-rooms.” Queen Mary, wife of King George V, often telephoned to say that she would be arriving for tea that afternoon. The tearoom, laid out today as it would have been then—with elegant Edwardian sofas and armchairs, dainty tea tables, and ﬁne porcelain tea wares—has wonderful views out over the lawn and rose garden. Afternoon tea for 21stcentury visitors is served in the Granary Café, housed in the old stable yard. Developed from a smaller Tudor building in the mid18th century, Saltram is a ﬁne example of a wealthy Georgian home. It also contains records, wall coverings, and porcelains that add colorful detail to the history of tea drinking in Britain. As typical wealthy Georgians, Sir John and Lady Catherine Parker, and later their son John, gradually turned the house into a model of Georgian good taste. They hired Robert Adam to create neoclassical rooms and Joshua Reynolds to paint portraits of family members and to advise on purchases of art. During the 1740s, the Parkers introduced a variety of Chinese wallpapers—for example, the Chinese Chippendale bedroom is decorated with silk wallpaper that shows the processing and shipping of tea in China. In the 1760s, the younger John Parker, who had interests in maritime commerce, acquired many beautiful items from China. Cabinets around the house display porcelain tea jars, lidded tea bowls decorated with butterﬂies and ﬂowers, Chinese porcelain teapots, and Meissen and Royal Worcester British teawares that echo the Chinese style. The family employed a large number of household servants, and ledgers from the 1780s show that staﬀ wages often included an allowance of tea at a time when it was still far too expensive for working people to aﬀord. The famous British tea break perhaps has its roots in this 18th-century provision of tea for servants who were developing a taste for what had previously been an upper-class luxury. (Above and opposite page) The inﬂuence of Chinese style is apparent everywhere at Saltram—silk wallpapers, paintings on glass, fretwork, and porcelains that include tea jars, covered cups, teapots, and pieces of export Chinese tea porcelain decorated with the family crest. (Left) Visitors can have tea in Saltram’s restored chapel. A small octagonal castle in the garden was designed in Gothic style in the 1770s by Theresa Parker, the younger John’s second wife. These were the days when tea was still taken as a digestif after a midday or early afternoon dinner, and guests often retired to a folly or teahouse in the grounds of stately homes to relax and sip tea together. Theresa intended her castle to create a convenient place for visitors to take tea or to rest during their walks around the parkland and gardens that surround the house. Today tea is served in the restored 19th-century chapel. Julius Drewe (top left) built his castle between 1910 and 1930, and despite his determination to create a medieval-style stronghold, the rooms were warm and comfortable. Drewe planned a home ﬁt for a wealthy country gentleman and installed central heating, electricity, and a lift. Perched at the rugged northern edge of Dartmoor, Castle Drogo has the appearance of a medieval castle that might have featured in the tales of King Arthur and his knights. The house was in fact built between 1911 and 1930 for Julius Drewe, founder in 1883 of the Home and Colonial Stores, a chain of grocery shops that sold mainly tea. At the age of 17, Julius started work as a tea buyer in China for his uncle’s tea-importing business and then opened his own shop, the Willow Pattern Tea Store, in Liverpool, in 1878 when he was 21. Home and Colonial developed out of his success, and by 1889, he had made so much money from the enterprise that he was able to retire at the age of 32 and decided to employ architect Edwin Lutyens to build him a castle. At the time Drewe was working for his uncle in the 1870s, the price of tea had come down, and everyone in Britain could comfortably aﬀord to drink it. After the East India Company lost its tea monopoly in 1834, new tea-importing companies were established all around the coast of Britain. Brooke Bond began trading in Manchester, Lipton in Glasgow, the Cooperative Society in Lancashire, and Drewe in Liverpool. In 1865, the government had helped make tea more aﬀordable by reducing the tea tax to just sixpence per pound, and by the 1870s, cheaper British-grown teas from India and Ceylon were replacing China tea. Tea traders were busier than ever, selling a product that the British found they simply could not do without. Drewe seized the opportunity to sell tea direct from origin to the tea-drinking public, and by 1890, from his humble beginnings in Liverpool, he had opened 106 Home and Colonial Stores—ﬁrst in London and then all over the country. Some of his wealth bought him this unusual and eccentric castle, named for the 12th-century Drogo family from which Drewe is believed to descend. launch, manned by boatmen in straw hats ... They would then glide up the Thame to an enchanting tea-house Miss Alice had built on the river at the farthest point of her property. … The delectable tea … would be set out in the dining-room of the Pavilion. Then, just as the landaus were arriving, the weather might change, the sun would shine, and it was realised that the guests might prefer to go up river. Happily the Thame does not pursue a straight course through the meadows, but winds its way. This made it possible for the big iced cakes, the gingersnaps and wafer-thin sandwiches to be whipped oﬀ the table and packed into a pony-trap. This would be driven by a colleague straight across the ﬁelds to the teahouse at a speed which would enable the tea to beat the approaching launch by a short head.” Today, there is no launch or pony trap, but traditional afternoon tea is served in the Manor Restaurant, fashioned from rooms that were once the old kitchen and servants’ hall. The 45 rooms on view at Waddesdon Manor contain magniﬁcent French furniture and decorative arts from the 18th century. There is also an impressive Victorian garden. (Opposite page middle) Waddesdon’s pastry chef and his staﬀ in 1910. (Opposite page bottom) A picnic for the Prince and Princess of Wales at Waddesdon Manor, circa 1880. (Below) The ﬂagship store at World of Wedgwood is the brand’s largest retail space anywhere. (Right and below right) The eclectic Wonderlust collection of ceramics is used in the Tea Conservatory. (Bottom and opposite page top) Wedgwood’s Parkland is the porcelain of choice for the Tea Room at World of Wedgwood. orkshire is England’s largest county and ﬁlls her vast space with an astonishingly varied landscape of wild moorland; deep, craggy valleys with tumbling waterfalls and dramatic outcrops of granite-grey rock; gentle dales; rugged coastal cliﬀs; elegant Victorian cities; sprawling industrial towns; and neat, picture-postcard villages. An inspiration to the Brontës and a tempestuous backdrop to the passions of Wuthering Heights’ Cathy and Heathcliﬀ and to Jane Eyre’s harsh and lonely early years, Yorkshire fascinates and overwhelms with its mercurial temperament—one moment calm, benign, and bathed in sunlight and the next, sulking beneath glowering skies, battered by rough winds and thrashing rainstorms. Perhaps this is what makes it one of the best regions in the country for wonderful afternoon teas and traditional local teatime treats. There are so many excellent tearooms and hotel lounges to choose from in every corner of the county that each year, the Welcome to Yorkshire Tourist Oﬃce publishes Yorkshire’s Delicious Tea Trail, which includes between 40 and 50 venues. At teatime, Yorkshire weather calls for a Fat Rascal (a plump, fruity cross between a scone and a rock cake) or freshly baked Stottie Cake (a soft, ﬂat round bread that is split and ﬁlled with bacon and egg or for high tea eaten with Yorkshire cheese and pickles). And tea tables are often laden with the sizzling larded dough of Singin’ Hinnies (ﬂat, golden, and hot from the griddle, rich with currants and sugar); Yorkshire Parkin (a moist, sticky gingerbread made with oatmeal and treacle); and little Yorkshire Curd Tarts ﬁlled with a lemony curd cheese scattered with currants. All very traditional, satisfying, and ﬁlling—and all delicious! With the surrounding historic village of Buckden—trees and gardens in blossom, green dales rolling away into the distance, and a tidy patchwork of farmers’ ﬁelds all around—the views from West Winds’ garden enchant the eyes and capture the heart. This is a haven for walkers who hike the trails here, local families whose children can romp while their parents chat quietly over a cup of tea, and tourists from all over the world who love this charming stone cottage, its pretty garden in summer, and the crackling log ﬁre in the hearth on chillier, blustery days. This has been a tearoom on and oﬀ since the 1920s and is today owned and run by Lynn Thornborrow and Stephen Hounsham. Stephen grows the herbs that ﬂavor the sandwich ﬁllings; Lynn bakes all the cakes to favorite Yorkshire recipes; and together they serve wonderful lunches, afternoon teas, and cream teas, using local eggs, ham, beef, cheeses, and chutneys. The tea list includes powerful East African black supplied by Birchalls and other specialty teas such as Assam, Darjeeling, smoky Lapsang, various green teas, and herbal and fruit infusions. West Winds Tearooms is open from just before Easter each year until the end of October. old-silver borders, with silver electric candleholders in the centres. . . . Harrogate is a spa of the ﬁrst order, and during the summer we had many well-known visitors as customers . . .” In 1936, Belmont and his wife, Claire, took a luxury cruise on Cunard’s ocean liner, the Queen Mary. He was so taken with the style of the décor that in March 1937, he acquired premises in York and hired Cunard’s interior designers and ﬁtters to create a similarly opulent Art Deco interior at his second tearoom. In 1922, he opened a bakery; in 1924, a third tearoom in Bradford; and then a fourth in Leeds in 1930. But World War II brought bombs, as well as food and staﬀ shortages, and by 1945, Bettys’ ﬁnancial situation was so bad that Belmont was forced to sell the York tearoom. In 1948, Belmont’s Swiss nephew Victor Wild came to live in the UK, persuaded Frederick to buy back the York tearoom, and then joined the company as trainee manager of the York store. Bettys continued to thrive. In 1952, Frederick died, and Victor took control. Ten years later, Bettys acquired a rival teashop company, C E Taylor & Co., which also owned a small tea- and coﬀee-import business, and the now-famous company, Bettys & Taylors of Harrogate, was born. Over the years, some tearooms closed and new ones opened. Today, the six Bettys Café Tea Rooms in Harrogate, York, Ilkley, and Northallerton impress with their clever fusion of comfortable English tearoom, ﬁne Swiss chocolates, traditional Yorkshire bakery, and hearty regional lunchtime specialties. And Champagne Afternoon Tea in the Imperial Suite in Harrogate or the Belmont Room in York is a wonderfully luxurious indulgence in rooms that evoke the streamlined elegance of the 1930s. The food is sensational, and all the teas are from Taylors. Expect to be tempted by the array of luxury fruit cakes, fondant fancies, brightly colored macarons, teas, and coﬀees at the front counter—many are available by mail order. But who was Betty? Actually, no one knows, and this unsolved mystery inspired the publication of a little book entitled Who Was Betty?, which is full of enchanting, whimsical suggestions from famous authors as to her true identity. Oulton Hall was once a simple 18th-century farmhouse but was extended in the 1790s to become a grand house with beautiful landscaped gardens and a lake. Rebuilt after a disastrous ﬁre in 1850, it served as a convalescent home for wounded oﬃcers during World War I. In 1925, it was sold to the local council, who turned it into a hospital for the mentally ill. But it then stood empty, vandalized, and with no roof until 1991, when De Vere Hotels purchased it and spent £20 million on its restoration. Today, QHotels owns the hall and its 27-hole golf course, and the house is a popular venue for afternoon tea, weddings, and other celebratory and corporate events. Head Butler Peter MacMahon is a member of the Guild of Butlers and brings Old-World gentility and eﬀortless charm to the service of afternoon tea in the Drawing Room, where he has worked for more than 26 years. Behind the scenes, the hotel’s chef has drawn on Yorkshire’s traditions to create a menu of local specials. Sandwiches are ﬁlled with Yorkshire ham; warm scones are served with Stamfrey’s clotted cream; Yorkshire Tea Loaf is paired with crumbly mild Wensleydale cheese (a northern tradition); and rhubarb also features here in scones, desserts, and pastries. Singleorigin teas and a special Oulton Hall blend are all from Taylors of Harrogate, and a range of herbals includes one with dried rhubarb! Shirley Quarmby bakes the most amazing cakes. Her creations are works of art that look as if they were made in a professional pâtisserie. And yet, her love of preparing cakes, chocolates, and delicious savories for afternoon tea is just a hobby—from Monday to Friday she works as an IT business analyst. Once a month, however, on a Saturday or a Sunday, she hosts tea parties for up to six people in a cosy corner of her kitchen in Saltaire, a fascinating Yorkshire town built by Titus Salt in the 19th century for the people who worked at his textile mill. Shirley is from Zimbabwe; Chez Shamwari means “at my friend’s house” in Shona (the language of the indigenous Mashona people), and her tea occasions are truly gatherings of friends. She advertises as a “clandestine bistro and tea room” and keeps her address completely secret, only revealing it to guests just before the appointed day. But of course, the tea parties are so special and fun that it is only the location that is still a secret, and she has a long waiting list of would-be customers. The aim of these happy occasions is not to make a proﬁt but to practice her cookery skills, serve excellent tea, and make sure that everyone has a really wonderful time. Faces light up, and eyes pop when she brings to the table her mini beef wellingtons, beetroot and goat cheese macarons, gift-wrap carrot cake tied with sugar-glazed carrot ribbons (so clever and inventive! ), and stunningly theatrical strawberry gâteau. If there are ever any leftovers, they are given away or sold to raise funds for Shirley’s favorite local charity. (Above) Portrait of Charles, the 2nd Earl Grey. (Right and above right) The East Quadrant of Howick Hall houses the Earl Grey Tea House where visitors can have tea and a variety of freshly baked goods following a tour of the estate. parish church where the 2nd Earl is buried. Charles, 2nd Earl Grey, carried out important work to the grounds in the early 19th century. The 3rd Earl developed formal Victorian gardens, but the 5th Earl chose a more informal, natural style of planting which endures today. And since 1985, the grassy tracks and sweeping slopes of the new arboretum tempt yet more gardeners and plant lovers to Howick. With head gardener Robert Jamieson and other plant specialists, Lord Howick has journeyed all over the world in search of seed from rare wild trees and shrubs. After a stroll around the estate and a browse though the Visitors’ Centre (staﬀed by very knowledgeable and friendly volunteers), the Earl Grey Tea House in the old ballroom in the East Quadrant provides a haven for a recuperative pot of tea (Earl Grey, of course! ), savoury lunchtime salad or sandwich, or a generous teatime slice of one of the irresistibly delicious homemade cakes. ea found its way into Ireland in the 17th century. Yet because of the exorbitant cost, it was considered to be a luxury beverage and was drunk only in upper-class homes. By the second half of the 19th century, as Britishgrown tea from the colonies became more available and prices gradually reached a level that made it aﬀordable to the entire population, sturdy black tea taken with creamy milk became the standard daily refreshment. Today, favourite blends balance rich robust Assams with powerful Ceylon and punchy Kenyan black teas. The Irish drink between four and six cups of tea a day—more per capita than anywhere else in the world. Cups of tea punctuate the social round—tea at breakfast, tea midmorning, afternoon tea between 3:00 and 5:00, high tea as an evening meal for some families at around 6:00, and more tea before bedtime. During the ﬁrst half of the 20th century, tea, along with sandwiches, scones, and cakes, was served in smart hotels. And on market days in the main towns, wealthy folk would spend the day shopping and then treat themselves to the luxury of afternoon tea before travelling home in time for dinner. The tradition of afternoon tea in hotel lounges and conservatories in both Northern Ireland and Éire continues today, and the same irresistible selections of savouries, warm scones, and artistic displays of little pastries attract as much excited attention as elsewhere around the globe. Most hotels and tearooms focus on the time-honoured classic menu, often using local Irish ingredients, but a few have tweaked the tradition by theming the food or by adding a little extra treat such as a tea cocktail or a mini feast of special desserts—just enough to intrigue and tempt. The Westin Dublin serves a traditional afternoon tea with all the anticipated treats—sandwiches of dill cream cheese and cucumber, roast Irish beef with horseradish and tomato, Irish oak-smoked salmon, buttermilk fruit scones with clotted cream and homemade strawberry jam—all delicious! But to make things a little more exciting for anyone who wants a change, the hotel’s team of mixologists has created an innovative, pioneering cocktail tea called Time for Gin Afternoon Tea. When the teapot arrives at the table, there’s nothing as predictable as brewed tea inside. Instead, it contains a tipsy blend of gin, lime, mint, and freshly pressed churned apple juice—the Hendrick’s Victoria Mojito! The Westin stands very close to Dublin’s Trinity College, which features in James Joyce’s Portrait of the Artist as a Young Man. To complement the tongue-tingling inebriant beverage, the cake stand brings seasonal teatime tidbits inspired by Joyce’s writings, such as conﬁt of pork cheek with Stilton and honey aïoli; a tall cone ﬁlled with prawn cocktail; rolled spiced roast beef with spinach, red onion, and horseradish; and little blinis with smoked salmon. On the middle tier of the stand, there might be slices of freshly baked banana and walnut bread with cinnamon and honey butter. And the lowest layer might hold popping vanilla marshmallows, popcorn panna cotta, almond and red currant frangipani tart, and a chocolate and caramel sea-salted brownie! Served in the Atrium Lounge, a sort of outside-in covered courtyard space at the heart of the hotel, and quirkily oﬀering a cocktail in a teacup, this is indeed a peculiar but deliciously stylish and seductive afternoon tea. Located in the historic Georgian center of Dublin and close to the National Museum and the National Gallery, The Merrion Hotel is naturally a popular and busy location for tea. The hotel was created from four grand townhouses built in the 1760s. The high ceilings, generous windows, and harmonious proportions of the drawing rooms make this a very appropriate and gracious setting for traditional afternoon tea. On ﬁne days, perhaps choose a table on the Garden Terrace where fountains ﬂow, foliage cascades from stone planters, and birdsong ﬁlls the air. The Merrion has devised Art Tea, a witty interpretation of the hotel’s important collection of ﬁne contemporary Irish art. Executive Chef Ed Cooney and Master Pastry Chef Paul Kelly have created nine pastries, each inspired by a piece of this art. Three are served at a time, and the collection is rotated constantly. So, when you’ve enjoyed the sandwiches and bridge rolls, warm scones and tea breads, you may ﬁnd yourself nibbling on the Tahitian landscape of Path Moorea by Pauline Bewick (a dark chocolate cream, milky vanilla cream with zingy lime and white chocolate, tiny chocolate palm trees catching the breeze) or Roses and Temple by Patrick Hennessy (a rosewater and orange mousse on a crispy white chocolate praline biscuit). Each guest receives a copy of The Merrion’s art collection catalogue to browse through whilst indulging in art that is good enough to eat! raspberry and strawberry jam and Irish clotted cream, and the sweet stand is arranged with tantalisingly gorgeous pastries—Caramel Zephyr Banoﬀee; Tanzanian Chocolate Tarte; Raspberry, Vanilla, and White Chocolate Éclair; and a Noisette and Caramel Chocolate Brownie. How can anyone resist? The Cygnets Afternoon Tea for younger visitors (so named for the swans that glide across Castle Hume Lough) spoils children with ﬁnger sandwiches ﬁlled with peanut butter and jelly; toast with rich, creamy Nutella; and a chocolate or strawberry milkshake. The loose-leaf teas served to accompany such indulgence include a powerful Irish Breakfast; Japanese Sencha; Irish Whisky Cream blended with malty Assam, Irish whisky ﬂavouring, and a hint of cocoa; Peach Oolong; Moroccan Mint; Ginger and Orange Chai; a creamy rhubarb infusion; and rooibos ﬂavoured with strawberries and cream. Champagne or Prosecco are oﬀered for special celebrations, but Lough Erne suggests something diﬀerent—Gin & Bitter Orange Tonic made with Irish Boatyard Gin, or Boatyard Bramble, a cocktail of Boatyard Gin Chambord (black raspberry liqueur) and a dash of lemon juice. No wonder the hotel was awarded Luxury Resort of the Year in the Luxury Travel Guide Awards, 2017. The Irish are famed around the world for their spontaneous hospitality. Visitors to the house have always been warmly welcomed, oﬀered a “cupán tae” and griddle cake hot from the pan, a thick slice of warm soda bread spread liberally with local butter and homemade jam, a slice of “barm brack” ﬁlled with spices and plump fruit soaked in cold tea, or a generous portion of homemade porter cake (a rich fruitcake made with a Guinness-like dark beer). In the past, huge rounds of plum cake packed full of dried fruits were baked and stored in the larder ready for the arrival of unexpected guests. And whenever there was a knock at the door, thick wedges were arranged on a large platter, potato cakes or soda scones would quickly be set to brown on the hot griddle, and the kettle would be brought to the boil. Oats and potatoes have long been staple ingredients in Irish baking. Favorite teatime fare still includes warm oatcakes, buttermilk oaten bread, potato cakes, “boxty” bread made with mashed and grated potatoes, and griddle cakes ﬂavored with local fresh fruit or sultanas and raisins. Baking and the production of these traditional foods have always been such an important part of Irish life that in the seventh century, a law proclaimed that foster parents were obliged to teach the skills of ﬂour sieving, kneading, and baking to all young girls. The law also stated that anyone who damaged or misappropriated the griddle, the kneading trough, the sieve, or the wooden measuring vessels would be subject to legal proceedings! Perhaps the most famous Irish teatime treat is soda bread. Soda was introduced as a raising agent in the early 1800s and was immediately welcomed, as it allowed housewives to put a delicious loaf of warm bread on the family tea table in less time and with less hard work. Instead of waiting for a yeasted dough to prove, a soda loaf of ﬂour, salt, bicarbonate of soda, and buttermilk could be mixed, lightly kneaded, and baked in less than an hour. All aboard for uniquely British teatimes! ver since its heyday in the frothy, high-fashion days of the Edwardian period at the beginning of the 20th century, British afternoon tea was served not just home and in elegant hotel lounges, but also on steam trains, oceangoing liners, and aeroplanes. That continues today, of course, on luxury modes of transport such as The Orient Express, the Queen Mary II, and upper-class cabins on long-haul ﬂights. But now, to add to the fun and sense of celebration, a trend to serve tea in more quirky situations is growing. My favorites in Britain today are some of the vintage steam trains operated privately by volunteer railway workers up and down the land; boats on the Thames; and London’s vintage, bright red Routemaster double-decker buses. The crockery and food may not be quite as gracious and reﬁned as that at Claridge’s or The Langham, but to sit sipping tea and nibbling sandwiches while the cityscape or countryside moves gently past on either side is delicious. The regular, nostalgic clicketyclack of the train wheels on the track, the slight rolling of the steamer in the wake of a speeding launch, and the sway of the bus as it rounds the corner at a major junction in central London are all part of the excitement. For a full afternoon tea before you ride this vintage railway, book a table in the Art Deco Refreshment Rooms on the platform at Tenterden Station in Kent and tuck into all the sandwiches, scones, and cakes. Seats outside aﬀord an excellent view of all the activity on the tracks—engines being shunted and trains arriving and departing, leaving puﬀs of smoke and hissing steam in their wake. Or instead, climb on board for a yummy cream tea on the comfortable old Wealdon Pullman train that winds its way from Tenterden Station to Bodiam, just over the county border in Sussex. As the train chugs past ﬁelds of sheep and across the Kent marshes, happy customers sip the welcome cups of tea and dollop thick clotted cream and Tiptree jam onto their scones. And just before the train arrives at Bodiam, as they lick the last crumbs from their lips and enjoy the last few drops of tea, they turn to peruse the 14th century medieval walls of Bodiam’s moated castle, where knights in armor once tried to knock each other oﬀ their horses on the jousting green. Departing from Butlers Wharf, where the nowrefurbished warehouses used to store tons and tons of bulk tea, B Bakery’s two Afternoon Tea Boats (The Edwardian carries up to 50 people, and the Elizabethan has places for 120) are always fully booked for the twoand-a-half–hour trips up the river past Shakespeare’s Globe Theatre, Tate Modern, Parliament, and Tate Britain, as far as the new American Embassy at Battersea, and back down under Tower Bridge, past Canary Wharf, the Cutty Sark, and beyond. I sailed on the Elizabethan and had the most wonderful time. As we arrived and climbed the elegant staircase, with its polished brass rails and shiny wood banister, to the wooden dance ﬂoor (what a perfect venue this would be for a tea dance! ), we were served a glass of sparkling wine, then mingled and chatted with other excited passengers. Also onboard this and every Afternoon Tea Boat tour were B Bakery’s owners, Brigit and Philippe Bloch. They are always there to ensure that every journey is perfect, and they move around the tables, chatting to passengers, answering questions, and making everyone feel special. Their French staﬀ, all dressed engagingly as cheeky French sailors in stripy blue-and-white shirts and a range of nautical hats, were all friendly, smiley, and helpful. For the ﬁrst half hour of the voyage, we stood on deck in the sunshine with our glasses of wine, enjoying the famous riverscape. As the boat slowly turned around close to the vast new development at Battersea, we were invited to take our seats for tea in the saloon downstairs, where everything looked delightfully elegant and charming. Just as in the Covent Garden shop, the tables are set with vintage mix-and-match china, three-tier cake stands, and generous portions of B Bakery’s lovely food. The tea is served in colourful ﬂoral pots that are reﬁlled as often as required. The afternoon passed much too quickly as we watched London go by and conversed with the friendly, interesting people sharing our table. When our voyage was over and we found ourselves back at Butlers Wharf, I think everyone was silently promising themselves to do it all again very soon. Square, and many more famous landmarks. Book ahead to sit on the upper deck, or choose a table downstairs. When you climb onboard the big red bus, you will ﬁnd your table set with bright pink napkins, pretty vintage china plates, and a colorful array of tea treats (neat ﬁnger sandwiches, quiches, smoked salmon blinis, scones, cupcakes, macarons, and other cute pastries) served on a two-tier cake stand. The tea menu oﬀers Earl Grey, English Breakfast, green, jasmine, Darjeeling, Moroccan mint, or rooibos. Once you have chosen, your tea is quickly delivered in a tall, covered plastic cup decorated with images of red buses and other London scenes in whimsical B Bakery style, which you are allowed to take away with you when you leave. During afternoon tea, the cup sits in a neat little well in the table to keep it safe. The waiters and waitresses are charmingly French, give a gentle commentary during the trip so that you know where you are on the route, and make sure you have everything you need to make your tour joyful and jolly and unlike any other tea experience you’ve ever enjoyed. For those who prefer to use their own wheels, the B Picnic Afternoon Tea comes in a bright pink box that contains all the usual B Bakery treats and cups of tea, plus it ﬁts perfectly into the panier of London’s Boris Bikes (the pay-and-ride bicycles introduced to central London by Boris Johnson when he was London’s mayor), so cyclists can choose a nearby park, a riverside bench, or their own back garden for a leisurely picnic tea. B Bakery also has plans to acquire a coach and horses to drive teatime customers around London’s quieter green spaces so they can pretend they are back in Victorian times when Queen Victoria sometimes sipped her afternoon cup of tea in her carriage. A wonderfully eccentric way to enjoy afternoon tea! When Emilie Holmes decided to set up her Good & Proper Tea Company, her plan was to start by serving tea from a van that could be driven to places where people needed a really good cup of tea. Much better to take tea to the people than wait for the people to ﬁnd the tea! So, she bought a 1974 Citroën H van, raised over £14,000 on Kickstarter in one week, and converted the van into a travelling tea shop. After spending hours tasting teas, she chose ten high-quality varieties and headed oﬀ to her ﬁrst allocated parking spot at London’s Kings Cross Station, an area popular with upmarket street vendors. The van’s current home is Brockley Market in South East London one Saturday per month, usually from 10:00 a.m. until 2:00 p.m. On other days, the Citroën takes up residence at diﬀerent street markets, fashion events, rock concerts, classic car boot sales, and food festivals. (To ﬁnd out where the van will appear next, Emilie recommends following Good & Proper on social media.) Regardless of the location, Emilie serves her usual oﬀering of beautifully brewed teas and hot toasted organic crumpets with organic butter and jam or melting cheese and delicious onion chutney. The teas are brewed in glass pots using timers and water at the correct temperature delivered from a Marco Uber boiler. When leaf and liquor have been separated once the brew has reached the perfect ﬂavour, the pots are placed on little hot plates to keep warm. The selection usually includes Ceylon or Assam, Darjeeling, Jade Tips (Mao Jian), Yellow Gold Oolong, or fresh mint. The pairing of tea and crumpets is so perfectly English that it is really hard to resist, and the steady queue of eager customers is testimony to its timeless appeal. Emilie’s van has been such a success that she now also has a tea bar in central London. EDITOR’S NOTE: Recipe titles shown in gold are gluten-free, provided gluten-free versions of garnishes and processed ingredients (such as ﬂours, prepared meats, sauces, extracts, and stocks) are used. Photography by Marcy Black Simpson; Recipe Development and Food Styling by Janet Lambert; Styling by Lucy W. Herndon Royal Crown Derby Pemberley accent plate; Royal Crown Derby Ashbourne teacup and saucer from DeVine Corp., 732-751-0500, devinecorp.net. Godinger Symphony 3-tier server, 718-418-1000, godinger.com. Photography by John O’Hagan; Recipe Development and Food Styling by Janet Lambert; Styling by Lucy W. Herndon Page 2: Royal Crown Derby Old Imari teapot and Àat cup and saucer sets from Replacements, Ltd., 800-737-5223, replacements.com. Silver-plated tipping teapot with stand from private collection. Photography by William Dickey; Recipe Development and Food Styling by Janet Lambert; Styling by Lucy W. Herndon Page 7: Spode Camilla Blue cup and saucer set, square handled cake plate, and teapot; Spode Blue Italian creamer from Replacements, Ltd., 800-737-5223, replacements.com. Photography by John O’Hagan; Recipe Development and Food Styling by Janet Lambert; Styling by Lucy W. Herndon Page 9: Royal Albert Brigadoon dinner plate, salad plate, footed cup and saucer, and teapot from Replacements, Ltd., 800-737-5223, replacements.com. Photography by William Dickey; Recipe Development and Food Styling by Janet Lambert; Styling by Lucy W. Herndon Pages 13–24: Spode Camilla Blue 5-piece place setting, mu̇n dish, square handled cake plate, teapot, round compote, and 12-inch oval platter; Spode Blue Italian creamer, sugar, and pitcher from Replacements, Ltd., 800-737-5223, replacements.com. Linens and Àatware from private collection. Photography by John O’Hagan; Recipe Development and Food Styling by Janet Lambert; Styling by Lucy W. Herndon Pages 25–36: Belleek Pottery Shamrock 5-piece place setting, teapot, creamer, and sugar bowl from Replacements, Ltd., 800-737-5223, replacements.com. Wheaton Stripe table runner in Cactus Green, Wheaton Stripe napkin in Cactus Green, PB Classic Belgian Flax Hemstitch napkin in Green, and Tava napkin ring in Honey Stain from Pottery Barn, 888-779-5176, potterybarn.com. Floral arrangements by FlowerBuds, 205-970-3223, ÀowerbudsÀoristbirmingham.com. Photography by John O’Hagan; Recipe Development and Food Styling by Janet Lambert; Styling by Lucy W. Herndon Pages 37–46: Royal Crown Derby Old Imari teapot and tea strainer and bowl; Reed & Barton Windsor sterlingsilver small rectangular tray; Wallace Grande Baroque 3-light candelabra and round serving tray from Replacements, Ltd., 800-737-5223, replacements.com. Tipping teapot, Àoral design cream and sugar set, sugar tongs, Wedgwood Duchesse footed cake plate, table linens, Àatware, and round silver serving dish from private collection. Photography by John O’Hagan; Recipe Development and Food Styling by Janet Lambert; Styling by Lucy W. Herndon Pages 47–58: Royal Albert Brigadoon dinner plate, salad plate, footed cup and saucer, teapot, creamer, sugar bowl, and oval platter from Replacements, Ltd., 800-7375223, replacements.com. Mikasa Regent Bead Àatware, 866-645-2721, mikasa.com. Flower arrangement from FlowerBuds, 205-970-3223, ÀowerbudsÀoristbirmingham.com. Page 57: Rosanna Le Gateau pedestal, 877-343-3779, rosannainc.com. Photography by Marcy Black Simpson; Recipe Development and Food Styling by Janet Lambert; Styling by Lucy W. Herndon Pages 59–68: Royal Crown Derby Pemberley accent plate; Royal Crown Derby Ashbourne teacup, and saucer from DeVine Corp., 732-751-0500, devinecorp.net. Royal Crown Derby Heraldic Gold teapot from Replacements, Ltd., 800-737-5223, replacements.com. Godinger Symphony 3-tier server, 718-418-1000, godinger.com. Mini creamer and sugar set and tea strainer from private collection. Photography by John O’Hagan; Recipe Development and Food Styling by Janet Lambert; Styling by Lucy W. Herndon Page 127: Belleek Pottery Shamrock 5-piece place setting from Replacements, Ltd., 800-737-5223, replacements.com. Wheaton Stripe table runner in Cactus Green from Pottery Barn, 888-779-5176, potterybarn.com. Photography by William Dickey; Recipe Development and Food Styling by Janet Lambert; Styling by Lucy W. Herndon Spode Camilla Blue 5-piece place setting, mu̇n dish; Spode Blue Italian pitcher from Replacements, Ltd., 800-737-5223, replacements.com. NEW BOOK! While the custom of afternoon tea originated in Europe, the beverage itself has ties around the world. Tea Parties Around the World, a 136-page hardback book by the editors of award-winning TeaTime magazine, celebrates teaâ&#x20AC;&#x2122;s global roots with ten menus inspired by different countries and cultures. Expert tea pairings, along with a tea-steeping primer, make it simple to choose and prepare the perfect pot of tea to accompany any of the delicacies in this book. With 97 recipes, Tea Parties Around the World presents a collection of scones, savories, and sweets perfect for treating teatime guests to an international culinary tour without the need for a passport.